The Heritage Collection is a line of Lift Chairs produced by Pride Mobility, which are designed to both functional and stylish. Lift chairs of the Heritage Collection, which used to be called the Gentle Line, have a number of different fabrics to choose from and offer a button back design. Prides goal with this line was to offer a chair that is well priced and functional, while also still looking attractive and offering some features and accessories that are not available in the Pride Classic Collection. There are two base models, the GL-58 and the GL-358, with the GL-358 coming in a variety of sizes to accommodate most body types, including a Heavy Duty Lift chair. The largest, the Pride GL-358XXL, supports up to 600 pounds and is designed for use by people up to 6’1″, although there is a model that supports less weight, but can accommodate a slightly taller individual. 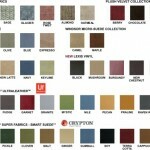 There are 5 fabrics available, which come standard with the Heritage Collection. This includes Taupe, Wine, Moss, Wheat, and Marine. There are also around 45 fabrics available as an upgrade, which includes a number of different types of Suedes and Vinyls. 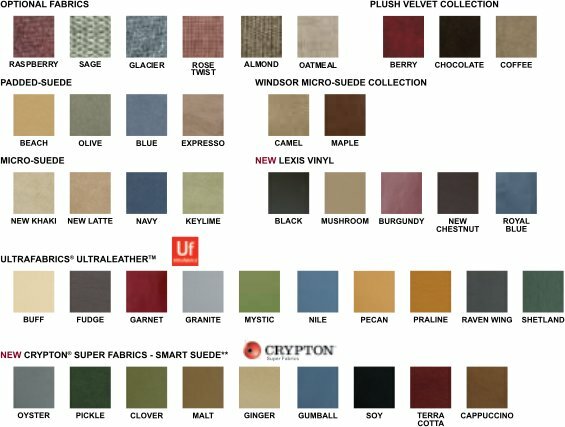 Several of the available suede options are designed to be easier to clean, as well as more breathable than other fabrics, with the vinyl also offering an easy to clean option. The Heritage collection is basically two different lift chair models, which then offer a variety of sizes to accommodate different heights and weights. This ranges in weight support of 375 pounds to 600 pounds and height support of 4’9″ to 6’2″, depending on the lift chair model. From a design standpoint, they are all very similar, all sharing a button back design, with the same color options. Although, the placement of the buttons does vary on a few models. The main difference between the GL-58 and the GL-358 is that the GL-58 is only a two position lift chair and the GL-358 has more padding in the backrest, footrest, and armrest. The GL-358 also has a slightly different footrest design. Since the GL-58 is only a two position lift chair, meaning it does not fully recline, as well as having less padding than the GL-358, it will probably not be as good of a choice for everyday use as the GL-358 would be. Overall, these chairs are of higher quality than Pride’s Classic collection or Golden’s Value Series and also offer a more comprehensive warranty. With the GL-358, a big part of selecting a model will come down to cost and the person’s weight and height requirements. 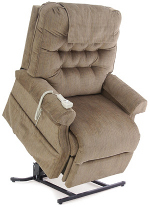 The GL-358 offers more padding and since it is a 3 position lift chair, will likely be the more comfortable option, especially for those who will spend a good deal of time in their lift chair. There are also two Heavy Duty Models, the GL-358XL and GL-358XXL, which are designed to support significantly more weight.